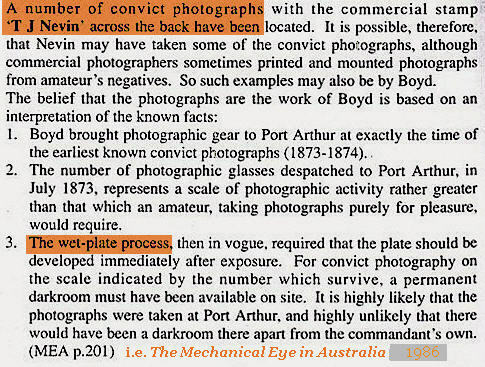 Several photo historians have questioned – and dismissed – the suggestion by Chris Long in the TMAG publication Tasmanian Photographers 1840-1940: A Directory (1995:36) that the Port Arthur Commandant A.H. Boyd was the photographer of the Port Arthur convicts in 1874. These include Joan Kerr and Geoff Stilwell, John McPhee, and Richard Neville among the more authoritative commentators. The entries of early photographers often have to be read in conjunction with Joan Kerr’s (ed.) The Dictionary of Australian Artists 1770- 1870 and [Davies & Stanbury’s 1986] Mechanical Eye as Long does not repeat its information. If Kerr and Davies are not simultaneously consulted then important information can be missed. As Long moves into the twentieth century he is forced to be more selective in the photographers he includes, so he lists only the “most notable” amateurs. Sometimes the entries are not clear. 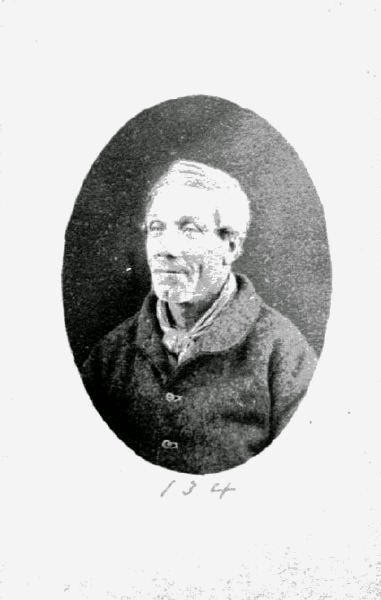 His important argument that Adolarious Boyd, the superintendent at Port Arthur, was the photographer of the well-known portraits of Port Arthur convicts rather than Thomas Nevin is not found in the Boyd entry, but rather under “convict photographs”. No “see also” reference is provided to that entry – rather one is given to Charles Woolley for whom one can see no obvious link. It would be very easy, therefore, to miss the substance of his argument. To a certain extent the book has the look of something produced by desktop publishing, and it seems to have the usual infelicities and typo’s of that genre. Editor Gillian Winter’s description of its publication history suggests that it was a difficult birth, and indeed she describes it as a “draft publication”, which is not altogether reassuring. 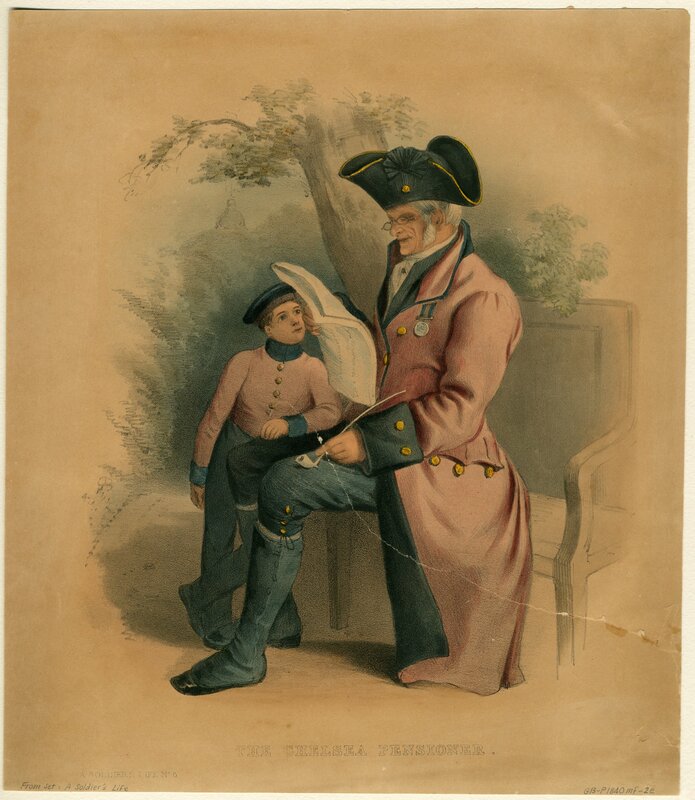 Source: Richard Neville, Curator of Australian Pictures at the Mitchell Library, Sydney: published online 3rd March, 1997, James Cook University Electronic Journal of Australian and New Zealand History. Richard Neville raised the alarm here in 1997. It is beyond argument that Chris Long’s “belief” and “interpretation” mustered in his cause for a Boyd attribution was founded in personal prejudice, lack of evidence, falsifications of sources and references, and a subjective aesthetic. 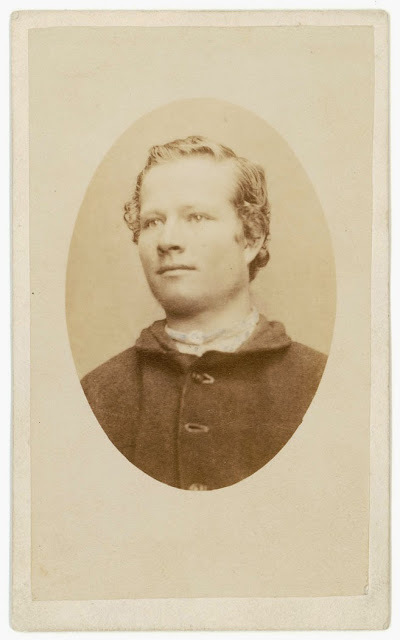 Included on page 98 is this carte-de-visite of convict Blore from the Tasmanian Museum & Art Gallery Collection where the misattribution to Boyd has persisted. It is obviously a copy from an original forwarded to the TMAG ca. 1985-87 when copies were made and circulated by the Queen Victoria Museum and Art Gallery to the National Library of Australia, the TMAG and the Archives Office of Tasmania. Emanuel Blore received a ticket-of-leave, 16th November, 1874. 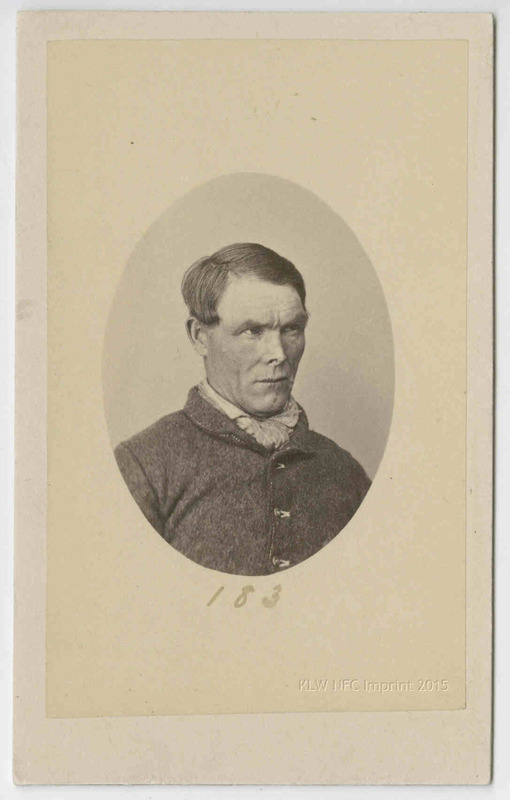 He was photographed on discharge at the Municipal Police Office, Hobart Town Hall by Thomas Nevin per police regulations. This carte of Samuel or Emanuel Blore was probably reprinted, inscribed verso, and numbered by Beattie in the 1900s for display and sale at his convictaria museum in Hobart. HISTORY: It is thought that the commandant of Port Arthur, A H Boyd may have taken the convict photographs at Port Arthur. Boyd was a very keen amateur photographer and is known to have had a room at Port Arthur fitted up in his garden as a studio and darkroom. Notes contained in the Mitchell Library’s Tasmanian Papers refer instructions given to Boyd to photograph the convicts prior to the closure of Port Arthur and to photographic equipment sent to Boyd in 1873. The TMAG catalogue entry for all convict portraits digitised and online until November 2006 contained this “History” re Boyd, including the fictions created by Chris Long about a studio and darkroom in his garden, together with the Mitchell Library reference. Clearly the cataloguist has taken the information from Chris Long’s entry in Tasmanian Photographers 1840-1940: A Directory (1995:36), but with the added gloss that the Mitchell Library references cited by Long include “instructions given to Boyd” which they clearly do not. On page 36 Long cites three cargo or way bills of photographic equipment: examination of the original documents (Tasmanian Papers Ref: 320) revealed that they contain no such instructions. No other document held at the Mitchell Library has ever been cited by Chris Long. However, eleven more “convict” or prisoner photographs taken by Nevin, two stamped verso with his name and the Supreme Court’s Royal Arms seal, are held there in the Mitchell Collection. “Some of these were attached to the same kind of information sheets used by New South Wales prisons at the time.” (note 49). This would suggest that the documentation was undertaken for the same instrumental reason as the New South Wales prison photographs. More would be known about the intended function of these images if their authorship was certain. 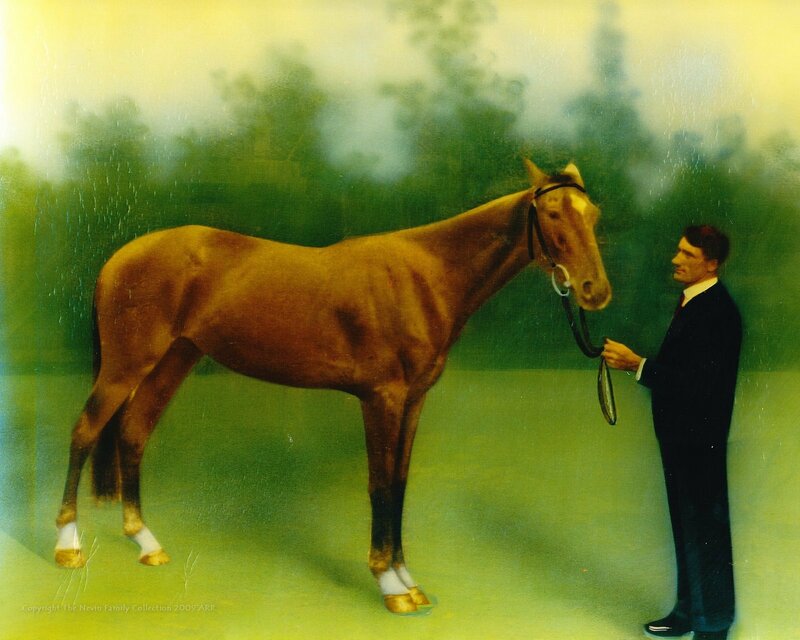 Examples held by the Queen Victoria Museum and Art Gallery, Launceston, had until recently been attributed to T. J. Nevin a Hobart photographer who had worked with Alfred Bock. Chris Long suggests that they were taken by the Commandant of Port Arthur, A. H. Boyd (Davies & Stanbury, op. cit. 201). It was only a suggestion, unsupported by evidence, and cited by Davies & Stanbury in a footnote on page 201. 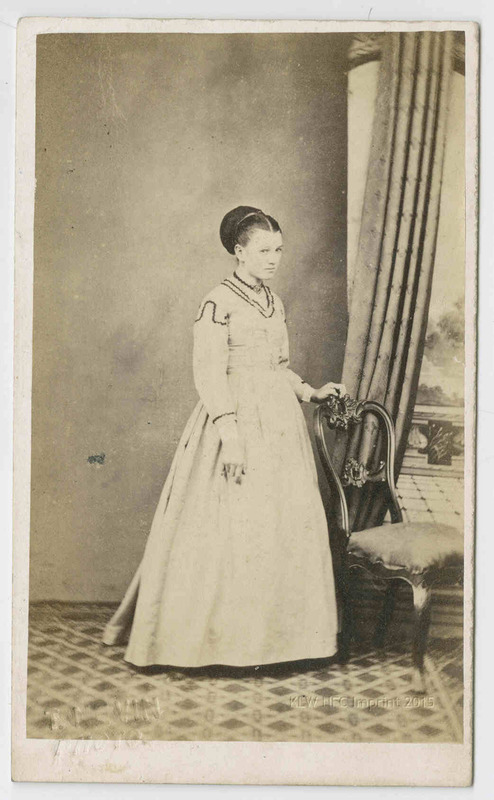 The “intended function” and the “authorship” of the Port Arthur convict photographs were known, documented, publicised, published and talked about by Geoffrey Stilwell, Joan Kerr and John McPhee, the curators and researchers of the 1977 exhibition of Thomas J. Nevin’s Port Arthur convict cartes held at the QVMAG. 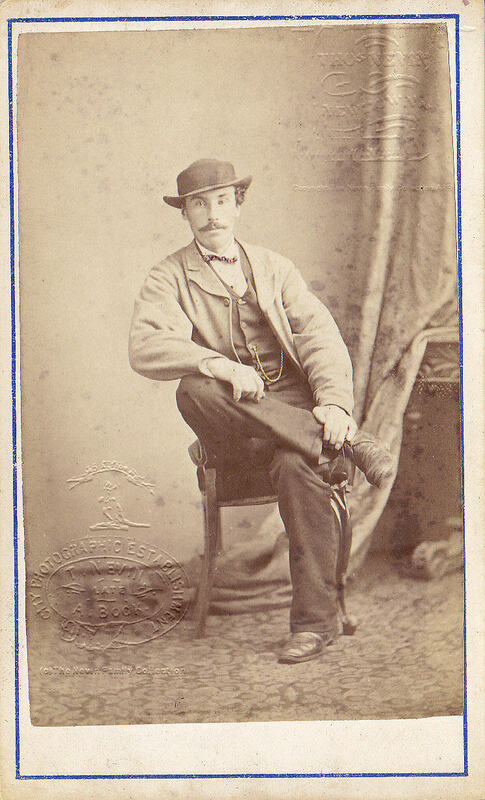 Nevin’s role as prisons and police photographer was common knowledge in the 19th century. Additional research now indicates a further purpose: to expose corruption during A.H. Boyd’s tenure. In July 1873, Dr Crowther called for the immediate abolition of Port Arthur, and drew the Parliament’s attention to the anomaly of prisoners with light sentences being sent to Port Arthur from the Hobart Gaol to inflate prisoner numbers there. Men with more than one alias, men with lengthy sentences to men with less than a six months’ sentence sent to be imprisoned with hardened criminals, and men sent as labour to work the prison site: their numbers ensured the perpetuation of the prison site and its costly maintenance. Above all, it guaranteed the livelihood of its chief official, A. H. Boyd, who had been investigated (so the Parliament was reminded) during an earlier accusation of corruption (1855) while employed at the Port Arthur prison as the accountant. The use of photographs was a means to monitor this trafficking in prisoners. On July 15, 1873, A. H. Boyd’s brother-in-law Attorney -General W.R Giblin tabled in Parliament the names of 109 prisoners sent to Port Arthur from 1871, and noted – to placate the criticism – that 60 of those prisoners had already been returned to the Hobart Gaol. 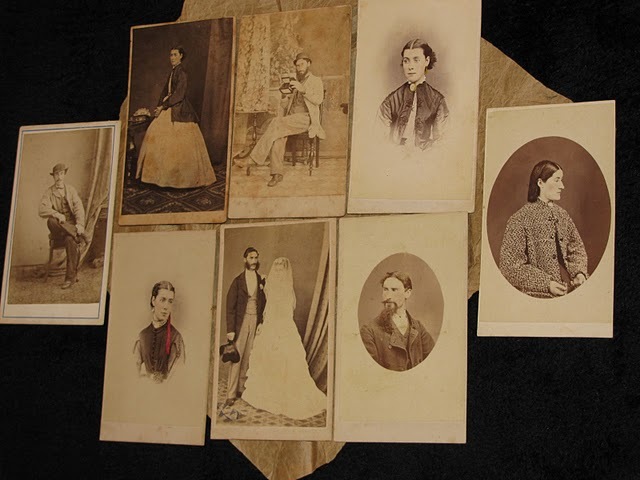 The rest were returned by October 1873 and photographed by Nevin at the Hobart Gaol. They were not photographed at Port Arthur prior to their return. The 300 or so extant cartes of “Port Arthur convicts” – i.e. Tasmanian prisoners – are simply random estrays of a much larger and lost or destroyed corpus of prisoner photographs numbering more than three thousand (3000) taken by Thomas Nevin and his brother Constable John Nevin at the Hobart Gaol, at the City and Supreme Courts, and at the Town Hall Municipal Police Office between 1871 and 1886. 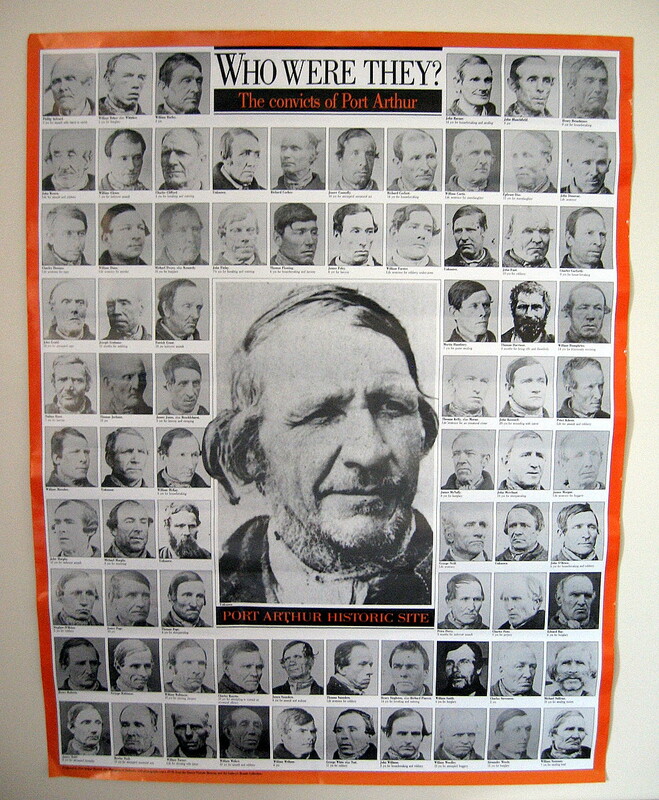 The men whose images survive in these extant examples may have been transported and incarcerated at the Port Arthur prison before 1853, but they were photographed not because they were transportees per se but because they were repeat offenders, habitual criminals in and out of jails and listed by police as suspects. They were photographed on arrest, at trial, on remand and sentencing, arraignment and discharge per the amendments to Penal Discipline legislation enforced in Victoria and Tasmania 1871-1873. The few convict cartes held at the TMAG which were catalogued with the Boyd misattribution with no other authority than the unsubstantiated hypothesis presented by Chris Long have been used by photo historians and curators for their exhibitions and publications, often compromising their publishers and their own credibility in the process (e.g. Helen Ennis, Andrew Sayers, Isobel Crombie, Warwick Reeder). Whatever the reason for choosing to use a handful of convict cartes from the TMAG for this exhibition and not the other extant convicts’ cartes by Nevin – 300 or so currently held in the other major public collections (NLA, AOT, QVMAG) – the effect is the perpetuation of historical misinformation. Aesthetic assumptions about photography as fine art may explain why these sorts of errors occur. The debate about the “authorship” of these convict portraits is first and foremost a debate among photo historians and founded on essentialist notions of the “artist”. Warwick Reeder explicitly uses the literary term “author” in his promotion of Boyd based on Chris Long’s “belief” (MA thesis, ANU 1995). Neither Long nor Reeder, nor indeed Ennis or Crombie checked the source of the story about the “darkroom.” The story was in fact written in the 1930s as a children’s fictional tale by a niece of Boyd, with no mention of either Boyd by name or prisoner photographs, but Long and Reeder have cited this piece of fiction as if it can function as historical fact. says Anne-Marie Willis in her Introduction to Picturing Australia: A History of Photography, 1988. Selecting a canon of “great photographers”, stylistic tendencies and movements, and dealing with photography as a sub-branch of conventional art history. Heroes and canons of outstanding practitioners are the goal of discovery. Telling a story of technological progress and scientific advancement of the medium, with no other primary interest. Treating photographic documents as unproblematic and self-evidently transparent records of historical events and thematic meanings. “photographs in their original context, to discover the ordinary and the typical and to come to an understanding of the dominant uses of photography in each historical period. However, outstanding individuals, technology and social history have not been altogether ignored. 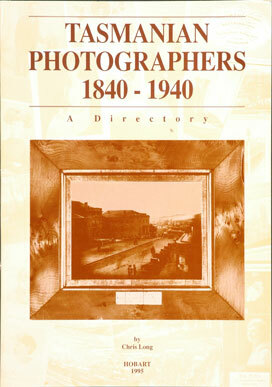 Instead of being given prominence, they have been woven into an account informed by the active role that photography has played across a range of institutions in constructing specific values and attitudes – both about photographic practice itself and about Australian society generally.” (page 3). Anne-Marie Willis’ concern with the “ordinary and the typical” is central to our examination of how these Tasmanian prisoners photographs affected the family life and professional practice of the photographer, Thomas J. Nevin during and after his contractual engagement and civil service with the Municipal Office and Prisons Department to take them, together with his brother Constable John Nevin at the Hobart Gaol who died prematurely in 1891, aged 39 yrs. To accord a prison manager such as A.H. Boyd any attribution as THE photographer is to enlist one of those mythical fictions in “hero” discourses beloved of administrators: middle-class power. Another commentator, Carolyn Strange, found on her visit to the Port Arthur Historic Site in 2000 that “1860s photographic images of real convicts ” were displayed with audio voice- overs telling of stories of convict lives that were fictionalized .One visitor said to Carolyn Strange on leaving the display, “I prefer the real thing”.